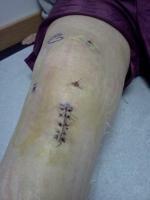 A year ago I had a complete ACL cadaver replacement. I followed all of the Doctor's orders and I went to all of my physical therapy appointments. When the PT released me (5-6 months after surgery) he told me I could return to working out normally but with limitation. I returned to my normal workout routine (squats and such - weight lifting and jogging lightly). Everything had seemed fine. I am now enrolling in the Sheriff's academy and it has been a full year since my ACL reconstruction. I have been running more and been trying to stay in good shape for the boot camp. My knee however has been getting pain in it every so often... the front of my knee and the back part of my leg as well.. nothing major - it does not impede any activities, and it does not look swollen at all. It seems as if it is just irritated and slightly tender. My Ortho DR that did the surgery took a look at me only 2 months ago and fully released me as well saying I was 100% recovered and my muscle balance and strength in the leg was great. He did not do an MRI however. What could be possible reasons for this pain/ache every so often - after exercise and such?? Is it just not used to it quite yet? Or is there something else possibly wrong with it?? I have an appointment with my DR next week.